To make their latest flagship device more beautiful and vibrant Samsung India has launch another color for its devices, Galaxy S8 and Galaxy S8+. Both the device is now available in an elegant Orchid Gray colour. With the launch of this colour, Galaxy S8 will be available in a rich colour palette, including Midnight Black, Maple Gold and Orchid Gray, while Galaxy S8+ will be available in Midnight Black, Maple Gold, Coral Blue and Orchid Gray. In Orchid Gray colour the Price for Galaxy S8 is Rs 57,900 and Galaxy S8+ will be available for Rs 64,900 both the device will be available for pre-order from July 5 to 11, 2017 on Flipkart and Samsung Shop. They would be available at select stores from July 12 onwards. Launch offer, includes free Convertible Wireless Charger worth INR 4,499 and INR 3,000 cashback on HDFC credit card. The flagship Galaxy S8 and Galaxy S8+ are the best smartphones for consumers seeking a seamless experience. The new colour – Orchid Gray – is a definite showstopper. Moreover, the captivating Galaxy S8 and Galaxy S8+ come integrated with Samsung Pay, Samsung’s revolutionary mobile payment service launched in India recently, the company Says. Apart from the new color, the other specification remain the same. The smartphones will come with the bezel-less Infinity display that offer 18% more display area, Galaxy S8 sports 5.8-inch and Galaxy S8+ offer 6.2-inch display. Both the smartphone is powered by Exynos 8895 processor clubbed with Mali-G71 MP20 GPU. Onboard Galaxy S8 offer 4GB RAM, 3000mAH battery, 64GB of Internal storage and Galaxy S8 plus offer 6GB RAM, 3500mAH size,128GB of internal storage. 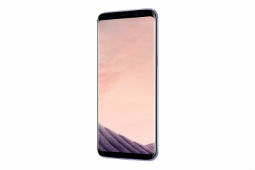 Galaxy S8 and Galaxy S8+ are equipped with 12MP rear camera with Dual Pixel Technology and 8MP front camera with smart autofocus, with F1.7 aperture that is perfect for taking bright, high-resolution photos even in low light conditions IP68 water and dust resistance certification, wireless charging support, Samsung Pay etc.